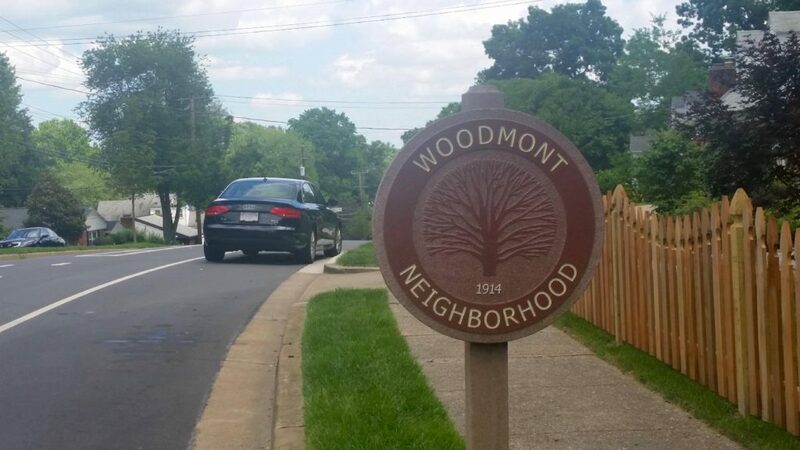 Woodmont in 2 sentences: Woodmont is a secluded yet convenient neighborhood that is located just one stop light from D.C. and about 1.5 miles to the nearest Metro stop. The neighborhood is one of the most desired communities in all of Arlington and is characterized by a wooded, sloping terrain that provides a scenic backdrop for the homes; both new construction, and those homes that date back up to 100 years. Woodmont is a small neighborhood in Arlington that is characterized by wooded terrain, a rolling landscape, and larger homes, both new and old. The community is situated in north Arlington and is bounded by Spout Run and Lorcom Lane on the south, Military Road on the west, and Nelly Custis Drive, Windy Run Park, and the George Washington Parkway on the north. The community consists of about 320 households and dates all the way back to 1914. The community association itself has had many names throughout the years. The association was first known as the Maywood Woodmont Improvement League, followed by the Thrifton Village Improvement League, then it became the Parkway Citizens Association, before changing its name to the Woodmont Civic Association in 2001. The neighborhood is secluded in all the best ways. The western most tract between Nelly Custis and Lorcom Lane will see more traffic on the artery streets that surround that portion of the neighborhood, but the main part of the neighborhood that begins just east of Windy Run Park will see little to no through-traffic. Though-traffic can be significant throughout Arlington, and even some of Arlington’s top neighborhoods like Cherrydale, Ashton Heights, and Lyon Park experience their fair share of cut-through traffic. While Woodmont features a minuscule amount of traffic, there are some exceptions. We will touch on that a little later in this post. As the name might suggest, the homes in Woodmont are surrounded by a plethora of trees setting up a park-like atmosphere. The rolling landscape sets the scene for some homes that have dramatic backyards that flaunt panoramic forest views Most homes are situated relatively close to one another, although residences are often separated by trees providing a natural boundary between properties. Any homes for sale in Woodmont will be strictly single-family homes. There are no apartments, condominiums, duplexes, or any other multi-family buildings in the neighborhood. In fact, almost all structures in the neighborhood are homes except for a few churches, the YMCA, and a few buildings at Fort CF Smith Park. The Woodmont YMCA specializes in gymnastics, child care, birthday parties, and kids and teen sports. The facility is surrounded by a field, a basketball court, and a playground. It is within walking distance to most of the eastern side of Woodmont and does attract visitors from all over the county and the area. Another attraction in Woodmont is the historic Fort CF Smith Park. This 19-acre park features relics from the Civil War fort built in 1863. The Hendry House is the main building in the park and it serves as a popular place for weddings, meetings, and can be rented out for other private events. The park also features a walking trail, a bird-watching area, a few different gardens, and a large field perfect for lounging or picnics. Another excellent outdoor amenity at Woodmont is Windy Run Park. The park totals over 14 acres and is dog friendly. The main trail that leads down to the Potomac River crosses the stream a few times before emerging at the Potomac with a picturesque (albeit, small) water fall. From the river you can take the Potomac Heritage Trail north, or you can take it south and make your way to Teddy Roosevelt Island. Other than two neighborhood churches and the buildings in the parks, all the structures in Woodmont are single-family homes, except for one. At the end of 24th Street there sits a mansion that is home to The Fellowship. Also known as The Family, the organization is one of the most powerful, well-connected Christian fundamentalist movements in the US. The Family’s membership includes congressmen, corporate leaders, and foreign ambassadors. The group is best known for the annual National Prayer Breakfast which has been held every February in D.C. since 1953. It’s kind of hard to describe what the group actually does. They basically teach the rich about Jesus Christ. And since 1978, they have called the Woodmont-based Doubleday Mansion, also known as The Cedars, its headquarters. Some big time names have visited The Cedars. Michael Jackson came to Woodmont in 2002. Hillary Clinton is rumored to have stopped by a few years ago and there’s a long list of foreigners who we wouldn’t know by name, but do rank high in their respective home country. In addition to this property, related organizations own two group homes toward the end of 24th street. These homes are actually zoned as dormitories, which basically means that they are oversized group homes that can house up to 12 people. There is one for males and one for females. The male house is known as Ivanwald while the female house is known as Potomac Point. In the past, there have been some issues with housing up to 12 people in each of these homes, but for the most part they do not impact the neighborhood at all. In Woodmont, you will find Cedar-people and non-Cedar people. You are going to have a portion of people that have some sort of loose connection to The Cedars, you’re going to have a group that just doesn’t care one way or the other, and you’re going to have residents in Woodmont that does not appreciate the group and doesn’t see what value the group brings to the neighborhood. The Cedars should not affect your thoughts on Woodmont significantly. It is interesting because Woodmont is such a small neighborhood, but you have this huge destination for powerful leaders both foreign, and national as there are a lot of politicians that are linked to The Family. The organization is something to be aware of, but other than the occasional extra traffic or speeders, there’s probably not a significant downside to having The Fellowship in the community. Homes in Woodmont are usually a bit older, and many have been renovated. Properties are surrounded by trees and wildlife is plentiful. Land is at an all-time premium in Woodmont so we are starting to see homes being built behind other homes and previous un-developed lots being bought up by developers. New construction homes for sale in Woodmont are starting to become more prevalent. But since Woodmont has mostly built-up lots, there will most likely not be a flood of new construction houses. The most we are seeing right now is The Reserve on Lorcom Lane. There will be some older homeowners bought out and new homes built, but at a fraction of the rate that we are seeing in neighborhoods like Rock Springs and Williamsburg. A majority of the housing inventory in Woodmont are cape cods, ramblers, and colonials. Demand in WOodmont is at an all-time high and for good reason. The neighborhood is exclusive, desirable, and best of yet, not pompous. Some affluent neighborhoods in Arlington pickup a reputation but Woodmont remains one of the most coveted and least pompous neighborhoods in the area. Perhaps one of the few downsides of living in Woodmont is the airplane noise from National Airport. The neighborhood is just one stoplight from D.C. and a is a 10-minute drive from the airport so while the location is almost the best in Arlington, noise from planes is apparent. Another possible downside is that the neighborhood is tough to buy into. The average sales price in the past year and a half (January 2015 – May 2016) was just north of $1,400,000. Woodmont combines the convenience of being close to D.C. with the exclusivity of being a small neighborhood surrounded by trees and wildlife. Only a handful of homes come available for sale each year and it would come as no surprise that many of them get the list price or sell for over list price. All things considered, Woodmont one of the best neighborhoods in Arlington and is still an unheralded neighborhood amongst the larger, and more publicized neighborhoods in north Arlington.